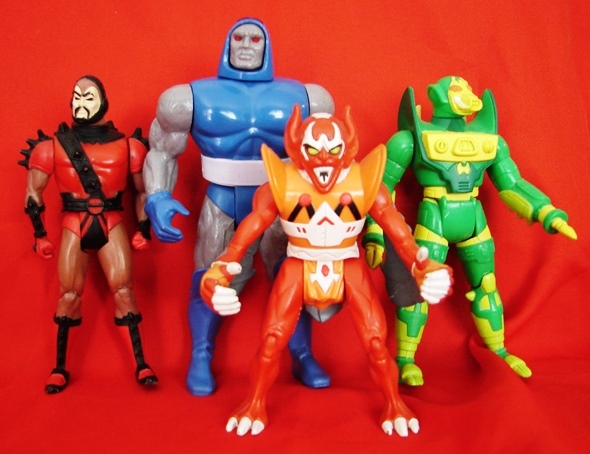 Toyriffic: League of Extraordinary Bloggers :: Plastic Fantastic! League of Extraordinary Bloggers :: Plastic Fantastic! Editor's Note: I am going to cheat a little and update this post as a League of Extraordinary Bloggers post, since the new assignment is 'Comic Books' and I just posted this a few days beforehand. So there! I have already mentioned my recent score of Plastic Man Archives Volume 1 for the incredible price of $20. The used bookstore where I discovered it had all eight volumes, but at first I was content with just nabbing Volume 1 - a book I have wanted for years. Well, yesterday I returned and nabbed Volume 2, also for the low low price of $20. Volume 1 re-prints Plastic Man's appearances in Police Comics #1-20 and Volume 2 re-prints his appearances in Plastic-Man #1 and Police Comics #21-30. I love Plastic Man, and am fascinated by his creator Jack Cole, so each of these volumes is a gem in my collection. Volume 1 contains the first ever appearance of Plastic Man (natch) as well as his partner in comedy Woozy Winks. Volume 1 also contains this hilarious sequence where Plastic Man is captured by a gang of female mobsters; their plan? Mold Plas into the likeness of gangster Eel O'Brien, (his own alter ego, unbeknownst to the gang of girl no-goodnicks), force-feed him some 'reefers' and send him off on a mad rampage through the city in an attempt to frame him! 'Whee!! I'm a Killer!!' BAM! BAM! BAM! Hahaha it just doesn't get any better than this! I'm absolutely LOVING these early Plastic Man adventures. Having scored both volume 1 and 2 so much lower than they generally go for on the secondary market just makes them all the sweeter! What comics are other Leaguers flipping through this week? Fortune and Glory (Days) is faster than a speeding Mullet! and Goodwill Hunting 4 Geeks gets all David Letterman on us. Plastic Man appears many times in Batman The Brave and the Bold. I like him, specially when he gets tangled with Elongated Man LOL!! I love all his Brave and the Bold appearances. Especially the episode with Baby Plas! (Whatever that means) LOL!!!! :D :D :D :D Just for those who become curious, "El Hombre que ríe" means "The Man Who Laughs". I love this story, it is mostly a horror story for me.